The database settings screen may be accessed via MIDAS Admin Options → Manage MIDAS → Database, and contains a number of settings relating to the actual database(s) in your MIDAS system. If this option is selected, and more than one database is defined, users will be prompted to choose which database they wish to login to and use from the login page. 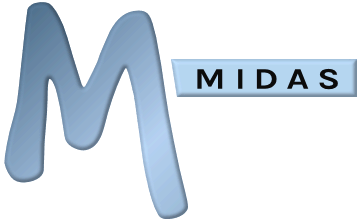 Allows you to setup another MIDAS database, running in parallel, on your server - provided your existing MIDAS license allows. You may wish to have multiple databases running in parallel via the same interface if, for example, your business has multiple offices/site locations and you want to have a separate database for each. If your current license doesn't allow you to create any additional databases, please upgrade your license. Transfer You & Your Permissions - This option will create the new database, and copy your login details from the current database to the new database. Transfer All Users & Permissions - This option will create the new database, and copy all users of the current database to the new database. Create new Admin User - Create a new database with a new administrative user. Selecting this option will prompt you for further details about the new user. If your database is to be created on a different MySQL server to the current database, you will need to untick the "Use Current" MySQL option, and enter details for the new MySQL server. Lists all backups of your MIDAS database(s) currently stored on your server. The list shows the date & time of the backup, and the amount of disk space being taken up by the backup. Create an instant backup of the current database. Delete the selected database backup. Restore your MIDAS data from the selected backup. Selecting this button will open a window allowing you to selectively choose which parts of the database to restore (i.e. bookings between two dates, client, invoices, etc). Alternatively you can select "Everything" to completely roll back MIDAS to the state it was in when the selected backup was taken. Controls how long MIDAS backups will remain on your server before being automatically deleted to conserve disk space. If the "Forever" option is present and selected, backups will remain on your server indefinitely, however you can still manually remove these backups at any time via the "Delete" button. For additional piece of mind, if you enter your e-mail address in the "Email Backups To" field, MIDAS will automatically email a copy of the backup to that address every time it makes one. Then, in the unfortunate event you lose data on your server, you can upload these backups to your /BKUPS directory and restore them from within MIDAS. Database backups are usually very small in size, as they are compressed. Typically, each backup will usually be less than 500Kbytes in size! This section allows you to export your MIDAS Bookings, Clients, Resources, or Invoice Summaries in a range of different formats for use elsewhere in 3rd party applications, for example spreadsheets, calendar programs, finance packages, etc. Simply select the parts of the database you wish to export. If exporting bookings, you can additionally select the date range of bookings to export. Finally, choose the format for the exported data from the drop-down list and use the "Export" button to begin your export. You will then be prompted to open/save the exported data file.